In homogeneous reaction-diffusion systems, symmetry-breaking (time or/and space) brings waves or patterns. In general, Hopf bifurcation gives rise to traveling waves; Turing bifurcation gives rise to Turing structures; and wave bifurcation gives rise to standing waves. Pattern formation from these independent instabilities has been well studied. Our recently work is to study their interaction, and patterns arising from them. 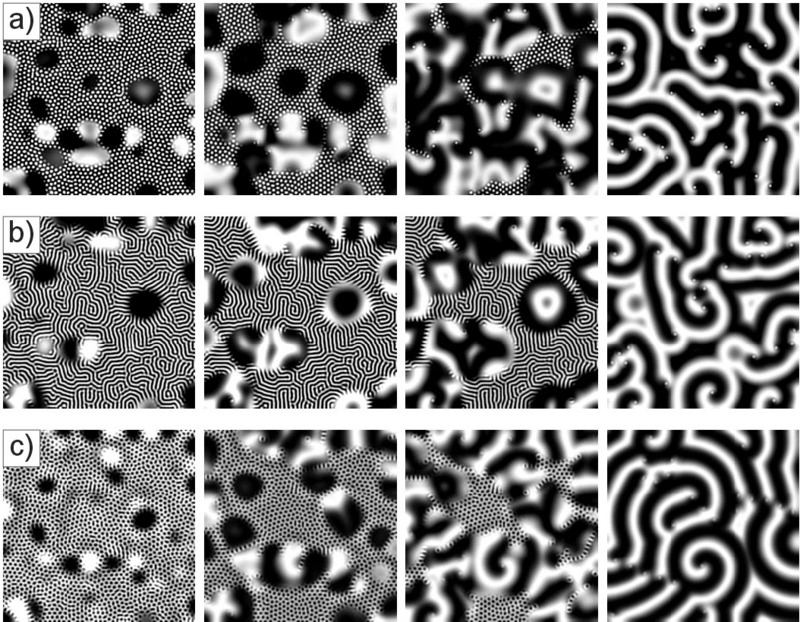 The interaction and competition between the stationary Turing and wave (oscillatory Turing) modes lead to the emergence of a large variety of spatiotemporal patterns, including modulated Turing structures, modulated standing waves, and combinations of Turing structures and spiral waves. The spatial resonances are obtained near codimension-two Turing-wave bifurcations. Far from bifurcation lines, we obtain inwardly propagating spiral waves with Turing spots at their tips.